Have you ever craved something to eat at two in the morning? Have you ever been so hungry but too tired or lazy to go out and get food, and ended up starving? Have you ever wished you had some kind of superpower so that you could have some foods when you don’t want to move? If you answered yes to all the questions above, I have brought you amazing, game-changing news. There are food delivery apps or services you can use when you’re starving and absolutely don’t want to move. I know it’s not the newest news, but what if they deliver Korean foods to you wherever you are and whenever you want? Isn’t that amazing? There are some food delivery apps that are out such as Uber Eats, Grubhub, or Postmates. One of their only major drawbacks is that they don’t offer that many Korean food options. Let’s be honest, we always crave Korean food. But it is really hard for you to cook yourself because Korean food usually takes lots of time and effort to cook. So I’d like to introduce a mobile application designed specifically for Koreatown and Korean food: Tastezip(www.tastezip.com). 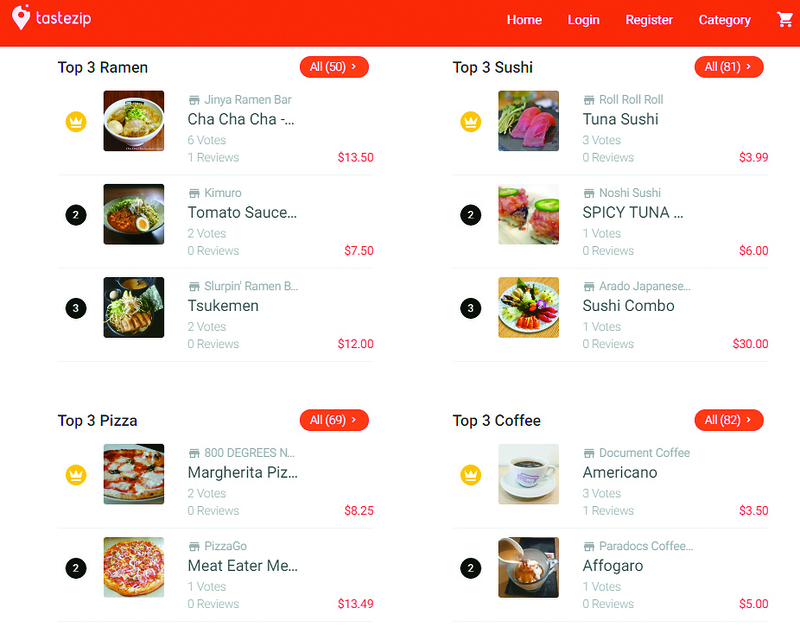 In Tastezip, much like popular food-delivery apps in Korea, you log onto the app, pick the food you want, and pay online. Tastezip places your order with a restaurant, then picks up the food you ordered and delivers it to you safely and quickly. The service is available from 9am to midnight. Items are delivered in a special container designed to keep the warm food warm and the cold food cold until it gets to the customers. Currently Tastezip has over thirty delivery men. If you order online, the delivery fee of $5 will be charged. If you order through a restaurant and ask Tastezip to deliver, $2.99 extra will be added on your check as a delivery fee. It offers the top-rated, most-ordered food chart to help people make excellent choices. Tastezip is such a lovely partner for students, seniors, or people who live by themselves in town. 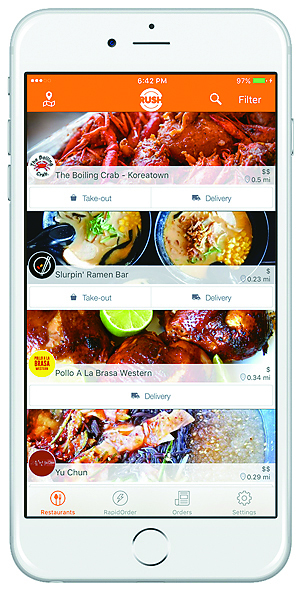 Rush Order(www.rushorderapp.com) is another app you can use to deliver some Korean food to your life. Unlike Tastezip, Rush Order only takes orders through the app. Rush Order gives you an estimate time of arrival once your order has been placed so that you can keep track of where your food is and rejoice while waiting for your food. This food-delivery app also offers “three-tap orders” in which you can place an order in just three taps of the screen. A great number of restaurants in town have been joining this food-delivery network recently. The food network is growing every day, and all you need to do is have your phone with you always to enjoy your food anywhere anytime!